Four men and two women have been arrested in Saratoga and Cupertino this December on suspicion of stealing packages, Santa Clara County sheriff's officials said Friday. Deputies said that 34-year-old Boulder Creek resident James Maybin and an accomplice broke into a UPS storage facility in Cupertino, stole a number of packages and loaded them into a stolen vehicle. Deputies arrested Maybin after he allegedly fled from the car full of stolen packages. The packages were returned to UPS for delivery. San Jose resident Jordan DelCampo, 21, was arrested in Saratoga after deputies say they found him with stolen diamond earrings, tickets for a Disney Christmas vacation and children's DVDs. A license plate number captured on security footage at a Cupertino home led deputies to arrest San Jose residents Ronald Martinez, 44 and Dolores Mestaz, 43. Deputies say they found the two with about 10 packages, mostly children's books and clothing. Martinez and Mestaz were arrested and are under investigation for other local thefts. 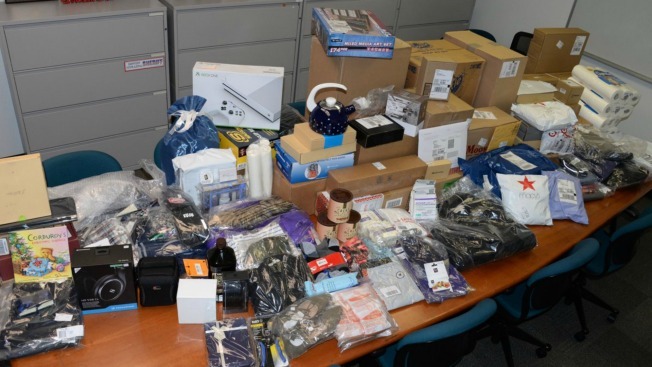 San Jose resident Amanda Matsuo, 23, and Sacramento resident Marcos Cruz, 26, were allegedly found with stolen packages including women's clothing and construction equipment. Deputies are also looking for two men caught on security footage stealing packages from San Jose homes. On Wednesday, a man stole a package containing Nutcracker dolls from a home on Porter Lane, sheriff's officials said. On Thursday, sheriff's officials said a man had stolen a package containing cat food from a home on Esther Drive. Anyone with information about these incidents can call sheriff's investigators at (408) 299-2311.